← Save Thousands on a Koons Ford Through Labor Day! 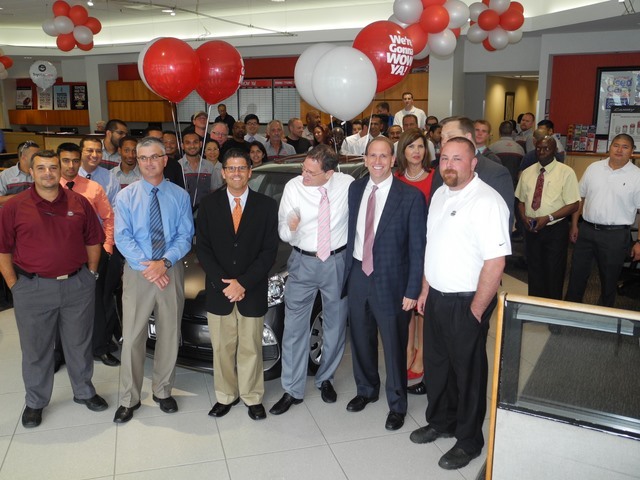 Gary Schoch, center with white shirt & pink tie, surrounded by Toyota and Koons staff in celebration of his new vehicle. Who doesn’t love a nice & heart-warming story on a Friday?! Gary Schoch, a Reston resident and long-time customer of Koons Tysons Toyota, couldn’t believe his luck when he received a call from Toyota’s corporate office. Like thousands of other customers, Gary had submitted his name in a drawing box while servicing his 2002 Toyota Prius at Koons Tysons Toyota in May. A month later, he received the call that would change his life forever. He’s now the proud owner of a brand new 2013 Toyota Prius C, compliments of Toyota!! Congratulations, Gary, for a win that is richly deserved!! Posted on August 23, 2013, in Automotive, Toyota and tagged Crystal Koons, Gary Schoch, Koons, Koons Toyota, Koons Tysons Toyota, Krystal Koons, Toyota, Toyota Washington DC. Bookmark the permalink. Leave a comment.